My Personal Truth / Why Organic? I read this article by Robyn O’Brien on the Prevention Magazine blog yesterday. It really spoke to me because at this time last year, the only thing I bought organic on a consistent basis was milk. And by doing so, I somehow felt like I was protecting my kids from that nasty growth hormone (RBGH) we’ve all heard about. The problem was, the rest of the food I was buying was riddled with GMO’s, toxic pesticide, petroleum based preservatives, artificial color and sweeteners, and who knows what else. So, think about cheese for a minute (which my daughter can eat her weight in), it’s made of milk right? So, if I buy cheese that’s not organic, it most likely came from cows that were given RBGH, and that were treated with antibiotics, and were also fed GMO corn grain, which has been sprayed with pesticide and put through an irradiation process with fillers, etc. That’s quite a backstory for a piece of cheese. And that’s just the “natural” cheese. Once you grab a box of Kraft Macaroni and Cheese, you’ll need to add all kinds of other things to the list. 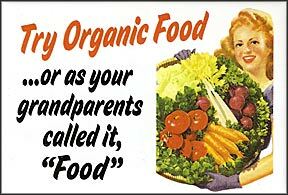 As Robyn said in her article, “when I first heard the term “organic” several years ago, I dismissed it. It connoted a “status” and conjured up two different images: lifestyles of the rich and famous or perhaps some alternative, hippie thing.” It made me laugh because that’s exactly how I felt about it. And when trying to explain all of this stuff to my mother-in-law (she was here when I began this food journey), I felt a little like a “hippie.” But, what most people don’t realize, is that much of these synthetic ingredients (including GMO’s) were added to our food supply in the last couple decades. Our parents didn’t have to worry so much about it because it wasn’t so much of a problem. So start small if you can. Use this list from EWG with the Dirty Dozen (dirtiest produce) and the Clean 15 (the cleanest produce) and buy organic when you can. I recently read an article that said Strawberries are sprayed with more than 200 pounds of pesticide per acre in California. The next highest is carrots, around 80 pounds per acre, just to give you a reference. I know that many grocery stores don’t have a great selection of organic produce, but it’s getting better. And, the more you buy, request, or demand it, the more they will provide. I buy all of my produce at Whole Foods, simply because the selection for organic is fantastic, and the prices are actually cheaper for organic produce there (vs Publix).